(a) Molecular recognition: The 5-Me-iso-dC:iso-dG base pair has been incorporated into hybridization assays to enhance probe-target specificity and reduce spurious hybridization to non-target sequences. For example, Collins and co-workers significantly improved the sensitivity of a branched DNA quantitative hybridization assay for detecting the HIV POL sequence by incorporating ~30% 5-Me-iso-dC and iso-dG into the pre-amplifier, branched DNA (bDNA) amplifier and alkaline phosphate probe sequences used in the assay (3). Use of this strategy resulted in a significant reduction in non-specific hybridization of the above three sequence types to non-target nucleic acid sequences, and thus less amplification of background. The limits of detection of the assay were improved 10-fold, from < 500 HIV molecules/mL to < 50 molecules/mL. (b) qPCR and artificially expanded genetic systems: A number of research groups have been working on optimizing PCR amplification on templates containing 5-Me-iso-dC. Such optimization is necessary to enable the full development of artificially expanded genetic systems utilizing an expanded genetic code, thereby allowing for the site-specific incorporation of novel functional components (such as unnatural amino acids) into proteins. In 2004, Johnson and co-workers observed that, by using the Klenow fragment of Taq polymerase (KF-Taq) in PCR, the fidelity of the 5-Me-iso-dC:iso-dG base pair was about 96% per amplification cycle (4). The limit in fidelity is chiefly due to the ability of iso-dG�s 1,2 tautomer to mis-pair with dT. More recently, Sismour and Benner solved this problem by using 2-thio-dT (dT*) in place of dT. dT*pairs with dA, but not with iso-dG (5). Using this artificial base pair system (5-Me-iso-dC:iso-dG, dA:dT*, dC:dG) with KF-Taq, the fidelity in PCR was increased to about 98% per amplification cycle. The achievement of high fidelity PCR with the 5-Me-iso-dC:iso-dG base pair opens the door to developing both artificially expanded genetic systems (6) and novel qPCR systems (for example, Promega�s Plexor technology) based on this approach. 1. Switzer, C.; Moroney, S.E. ; Benner, S.A. Enzymatic incorporation of a new base pair into DNA and RNA. J. Am Chem. Soc. (1989), 111: 8322-8323. 2. Horn, T.; Chang C-A. ; Collins, M.L. 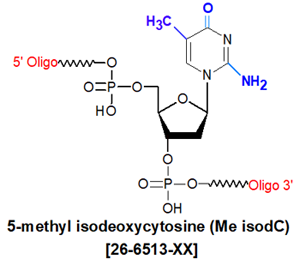 Hybridization properties of the 5-methy-isocytidine/isoguanosine base pair in synthetic oligodeoxynucleotides. Tetrahedron Lett. (1995), 36: 2033-2036. 3. Collins, M.L. ; Irvine, B.; Tyner, D.; Fine, E.; et al. A branched DNA signal amplification assay for quantification of nucleic acid targets below 100 molecules/ml.Nucleic Acids Res. (1997), 25: 2979-2984. 4. Johnson, S.C.; Sherrill, C.B. ; Marshall, D.J. ; Moser, M.J.; Prudent, J.R. A third base pair for the polymerase chain reaction: inserting isoC and isoG. Nucleic Acids Resl. (2004), 32: 1937-1941. 5. Sismour, A.M.; Benner, S.A. The use of thymidine analogs to improve the replication of an extra DNA base pair: a synthetic biological system. Nucleic Acids Resl. (2005), 33: 5640-5646. 6. Yang, Z.; Hutter, D.; Sheng, P.; Sismour, A.M.; Benner, S.A. Artificially expanded genetic information system: a new base pair with an alternative hydrogen bonding pattern, Nucleic Acids Res. (2006), 34: 6095-6101.